One of the things I love about the Internet is the way we can so easily share our experiences, especially the curious things we’ve witnessed. If you told someone what you saw they might not believe you but with the Internet, video technology embedded in all manner of handheld technology, and the likes of YouTube, you can now easily prove that you aren’t making stuff up. The following video is one of those kinds of experiences. In Ucluelet, BC, Canada someone caught on camera an example of interspecies play that I never would have believed likely. As I watched I couldn’t help thinking of the Disney classic Bambi and wondering why there isn’t an otter in that story. It’s so clear the otter is playing, his instinct at work trying to engage Momma. And while Momma’s curiosity is definitely triggered (she could easily have dashed to safety is she felt truly threatened) her other instincts are also in high gear with cautious care of your youngsters being top of mind. I wonder what might have transpired if there hadn’t been youngsters around to protect. Might she have been drawn in to play? And what would that look like? Watch and enjoy, and I hope you are as delighted with this interaction as I was. 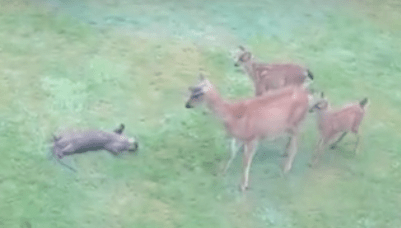 If that one isn’t enough, here’s another great video of a deer playing peekaboo and tag with a dog. The dog is inside the fence, the deer is outside and free to leave. If in doubt, watch the body language closely as they entice each other to play. One thing to notice is the dog is not chasing the deer, he is ahead or even with the deer as they run along the fence line.